How would you like better employee morale, more profit, less stress, more time to work on things you enjoy, and have people lined up at the door waiting to work for you? These are just a few of the benefits you may realize when you discover how to automate your business. “Okay,” I hear you wondering, “Is that actually what happens when you put your business on autopilot?” The answer is an emphatic YES! Hang with me for a few more minutes and I’ll give you specific examples of how you can put your business on autopilot and give you the exact steps you need to take to get started. But, before we delve into this, let look quickly look at where all this began. For the sake of time, I’ll spare telling you the entire story here, but if you’d like to learn more about how Ford built his company, I recommend My Life & Work – An Autobiography of Henry Ford. Interchangeable parts meant that the fender from one chassis would fit any other chassis. This helped eliminate the need for skilled craftsmen creating each and every part by hand. It also meant that parts would be more affordable, and more readily available when making repairs to these automobiles. Continuous Flow was an idea Mr. Ford was inspired to by watching the meatpacking process and a grain conveyor belt. If Ford could bring the work directly to the employees, this would save tremendous time because they would no longer have to move to and fro through the factory to complete their tasks. Division of Labor tied in directly with continuous flow. By bringing the work directly to the employee, they would be able to have employees trained to complete a specific task. Although this seems obvious in today’s world, in the early 1900’s this was revolutionary. The byproduct of the first three principles was a Reduction in Waste. Employees no longer had to trek back and forth. Interchangeable parts greatly reduced wasted materials and rework since the parts fit much more accurately. 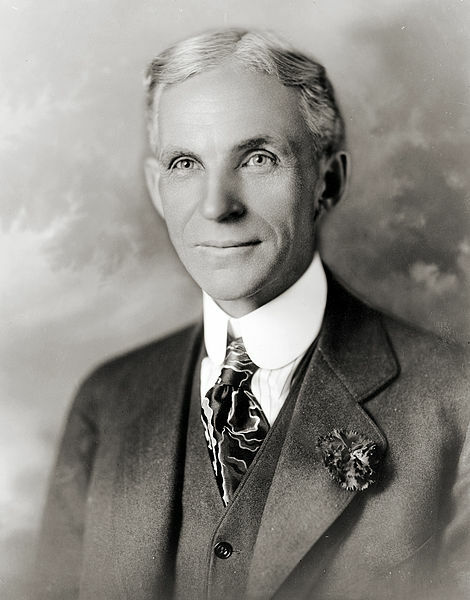 Henry Ford identified 84 distinct steps that needed to be completed in order to build one new Model T. After these 84 steps were identified, they were able to train employees to complete one specific task (step) over and over. Eighty-four steps! Yes, 84. Don’t let that number overwhelm you. Keep in mind they were assembling automobiles, which were and still are, very complex machines. Depending on the product or service you provide, you may have more or fewer than 84 steps. But for now, don’t worry about the number of steps . . . instead let’s focus on the benefits you will experience. By 1913 Ford was able to get these four principles working in harmony, and as a result he was able to sell cars at a lower price, while still maintaining a good profit margin. He also increased the wages of his employees to an unheard of $5 per day. The first step to putting your business on autopilot is developing a very clear understanding of the flow of your business. It doesn’t matter what type of business you have, it doesn’t matter if you sell a product or service–there is a certain flow that should take place, from the time an order comes in all the way through to the fulfillment of that order. What is this flow for your business? Have you identified it? Set a timer for 10 minutes and create list of everything that has to happen from the time an order is placed all the way until it is fulfilled. Common Excuses: Chances are good that you are saying to yourself, “But my business is different,” or “We sell too many different products/services and each one has a unique flow.” This is nothing more than a belief you are holding on to that has little to do with reality. How do I know? Well, I know because I tried to firmly hold onto similar beliefs for the first couple of years in business. In the web-development world, no two projects are ever the same. One may be a basic website, the next may require a client login section, and then the next needs a blog. That doesn’t even take into account that, with custom web-development, each design is completely unique. With so many variables how could we ever create a uniformed flow? The first place we began was to simply list out all of the steps that were consistent and common regardless of the type of website we were building. Next, we began looking for variables and options that we could eliminate that would help us have a more uniform offering. One example is that we now only build blogs on one platform, and that is WordPress. Prior to this, if you asked us to build your blog on the Blogger platform we would do it. Because each blogging platform is different, it would require specialized knowledge and extra work to build on all these other platforms. Okay, with your list of specific tasks in hand, let’s move to step 2. Henry Ford took all the specific tasks that were required to build a Model T and broke them down into 84 critical steps. Within each step there would have been dozens, or even hundreds of specific tasks that had to be completed. How many critical steps are necessary to fulfill your product or service? For us, at Ugly Mug Marketing, we broke our website development process into five phases. Within each of these steps there are dozens, if not hundreds, of steps required to complete the phase and move on to the next. Take 10 minutes to review your list of everything that is required, and cluster the tasks into core phases/components. If you’re anything like me, this process is about as exciting as sticking needles in your eyes. But trust me when I say, this work will pay HUGE dividends if you want to create a business that runs on autopilot. Step 3 – What can be outsourced? You do realize that in order to truly achieve a business that can successfully function, either with or without your presence, you have to remove yourself from the fulfillment process. So with this in mind, take a look over your list of what is required to fulfill your product or service, and place the person who is currently responsible for completing this task beside it. What percentage of the list is currently reliant on you to complete? There isn’t a right or wrong answer, but it’s important to understand the current picture within your business. The next step is to identify the steps that can be outsourced or delegated to someone else. Looking back over the list, take a look at the tasks for which you are currently responsible, and identify the 20% of these tasks that can or should be delegated or outsourced. For the sake of example, let’s assume there are currently 100 items on your list, and you are responsible for completing 80% of the tasks on your list. Your goal is to find 16 tasks (20% of the 80 tasks for which you are responsible) that can or should be delegated to someone else. Do you have someone that can do it? Does it require longer than 15 minutes to complete? Does it require specialized skill or knowledge? Is it complex to explain? Can you find someone to do it? Go ahead and take a few minutes to go through your list and ask the questions above for each one. Here’s an infographic to help you with these questions. Beside each of the tasks that can be delegated or outsourced place the letters, “TO” (To Outsource). At this point, don’t become overly concerned in trying to figure out, specifically, to whom the task will be outsourced. That will come later. The main objective, for now, is to get you thinking about how you can remove yourself from the fulfillment picture. Place a date beside each one, identifying the target date when you will have this specific task outsourced. Give yourself ample time, but be sure not to give yourself so much time that you feel a since of urgency. Next go through this list of tasks to be outsourced and cluster them based on the type of person needed to complete this step. Ideally, you will also be able to cluster these tasks to reduce the number of people needed to complete them. As you can see from this list, I was able to divide these tasks between three different people: Designer, Customer Service Rep, and Coder. Depending on the specifics of your business, you may find that you can get by assigning all the tasks to one person, like a personal assistant. But, honestly, it doesn’t matter if you have to assign tasks to one or ten different people–the process and methods for communication will be the same. Don’t have a good process for outsourcing? No problem–use our 10 Steps to Successful Outsourcing. Remember the Jetsons? The cartoon family who lived in the year 2062 in the futuristic utopia called Orbit City. Thanks to all the technological advancements and automation, George Jetsons’ workweek was two days per week one hour per day. Slightly better than a four hour work week. George’s two-hour workweek was made possible by technology that automated almost every aspect of his job. I’m not here to build your hopes up and lead you to believe that by implementing technology tools your workweek will magically dwindle. However, I do certainly believe that if you’re not currently using, and constantly considering additional technology, then chances are good you’ll be doing some unnecessary work. Each and every business has unique needs, and there are unique technology solutions for virtually every type of business. Because there are so many options and variables, I’m not even going to attempt to make specific recommendations. Instead, what I’m going to do is provide you with a method of determining what areas you should search for technology to help automate, and share a few tools that we use. Regardless of the type of business you have, chances are good that you have complete some activities in each of the following areas: accounting, invoicing, marketing, human resources, and product or service delivery. Do these align with your business? Are there a few additional core areas in your business? Go ahead and create a list of each of the core areas for which you and your team are responsible each week–keep them broad. With this list in hand, go ahead and write the percentage of your workweek (or your company, including all employees and vendors) that is spent working in each of these areas. Keep in mind we are looking for percentages of your (and your team’s) total available working hours. In our business, my team and I work a total of 100 hours. Using this example, that would mean that we only have a total of 100 hours to allocate between our core areas of business. Next, you’ll want to go through each core area and create a quick list of all the tasks that are done within that core area. The goal of this is to identify tasks that repeat on a regular basis. For the sake of example, let’s say that each month you bill your clients the same exact amount of money for the entire period under they are contracted. Currently, you have to manually recreate and resend these invoices each month. Go ahead and go through each of your core areas and build out the list of repetitive tasks. Once you have this list you’ll be ready to move to the final step. Let me begin this with a warning–there is rarely a technology tool that will provide you with exactly what you need to completely eliminate an entire core area of your business. If you begin your search looking for the perfect solution, more than likely you’ll be sorely disappointed. The only way to completely remove a core area is to outsource it. If having to manually recreate and resend invoices each month is the specific invoicing task that you are trying to eliminate, then those are the features for which you’ll want to search when looking for software to eliminate this task. Although I was using recreating invoicing as an example, this is actually a task that I wanted to eliminate a couple of years ago. My search for solutions brought me to FreshBooks. For what we do, FreshBooks isn’t the perfect solution; however, it does completely eliminate the need for us to manually recreate and send invoices each month through their recurring billing feature. It’s important that you give yourself 60-90 days to try out any new solution that you’ve found. I realize this is longer than most of the trial periods offered by these companies, but trying them for any period of time less than this and you’ll shortchange yourself. You see, as with anything, there will be a learning curve . . . and as with anything new, you will be accustomed to completing the tasks in a different way. This new way will be unfamiliar and a little uncomfortable. Only after you make it past this 60-90 day trial period can you realistically measure the effectiveness and time savings of this new solution. As you begin this process, you will discover there are a ton of options available, and most of them will–on the surface, anyway–appear to provide the solution that you are after. Given the sheer number of options available, it’s easy to get so distracted by your search that it becomes counterproductive, and you end up wasting more time than you’ll ever save. Are you ready to put your business on autopilot? Start by doing what Henry Ford did and look outside the norms of your industry and begin implementing change. Use Henry Ford’s four steps (Interchangeable Parts, Continuous Flow, Division of Labor, and Reduce Wasted Effort) as a guide to help you turn your business on autopilot. With a little concerted effort on your part it won’t be long before you start experiencing many of the same benefits. Now it’s your turn . . . what is preventing you from putting your business on autopilot? What tools and resources will you utilize to help automate certain functions of your business? Well done article, Wayne! Tons of useful tips. I’m finally starting to read The Four Hour Work Week…that quote from Branson is golden. Hey Luka – thanks! Send an email to julie [at] uglymugmarketing [dot] com and ask her for more info regarding our web design process.